It's no secret that I tend to view the world and our profession through Mickey-shaped glasses. 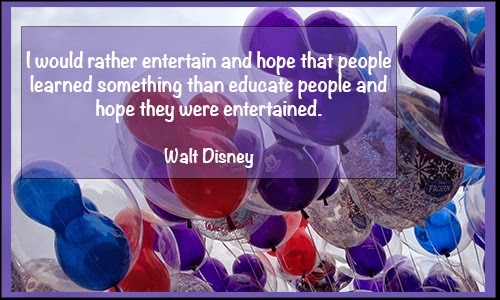 This is, after all, #10 in a series of posts about how the Disney culture might translate into education. So I know you won't be shocked to hear that I've been reflecting lately on a recent trip I took with my family to Walt Disney World. What struck me most profoundly this go around was how completely the Disney folks engage a visitor's senses. All of them. Continuously. If our experience of the world is affected by our 5 senses, then our experience of WDWorld is affected by them even more so. Every sight line in a Disney Park flows from one colorful and well-groomed vista to the next. The positive visual messages are ubiquitous. There are so many playful visual details (yes, including hidden Mickeys). The use of light, especially at night is part of what makes attractions like the Main Street Electrical Parade and IllumiNations so popular. The sounds of a ride are as essential as the sights, from the scream that launches Haunted Mansion to the sound of crashing waves at the end of Maelstrom. Music underscores every experience, from park open to the fireworks at the end. The language of Disney makes interaction with cast members stand out. I love it every time a cast member calls my daughter, "Princess." Of course, there are the classics that everyone references, Turkey Legs and Dole Whips. My favorites are the exceptional flavors that can be found when you have a Disney sit-down meal. One of the best meals I have ever eaten was at the California Grill. People actually applaud after Soarin', and I know a big part of that is the experience of smelling the orange groves and forest. Another favorite is the smell of fresh baked apple pie during Mickey's Philharmagic. If you haven't experienced Stitch's Great Escape, there is a great moment when it feels like Stitch is bouncing on your seat. During Mickey's Philharmagic, there are several moments when the audience feels water splash on their face. Visitors can experience the G forces associated with space flight when they ride Mission: Space. These are just a few examples, but what is even more impressive to me is how Disney messes with one's senses to create unique experiences. Dark rides like Space Mountain can make the sensations of movement even more dramatic. By hitting people with unpleasant smells, Disney can create unexpected (and comedic) effects in rides like Journey Into Imagination. 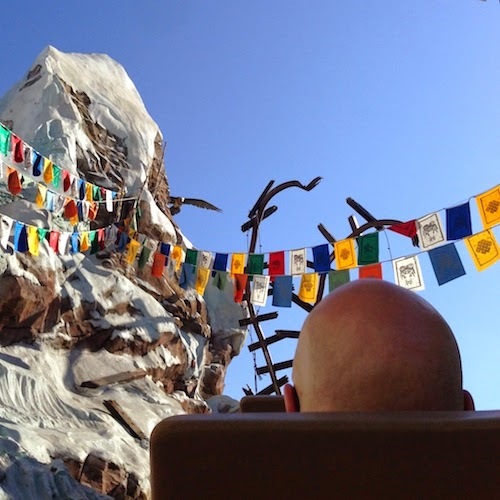 By switching rapidly from between speeds, rides like the 7 Dwarves Mine Train, Tower of Terror, or Expedition Everest can enhance the feeling of motion. So what does this all mean for your classroom? Our senses are deeply connected to our memory, our mood, and our engagement. By thoughtfully maximizing our use of sensory input, we can affect how our students experience our lessons and our environment. We can boost moods, set tone, underscore ideas, and increase interest in our curriculum. In other words, we can bring our lessons to life. When I think back to some of my most significant learning events and my most successful teaching moments, it's easy to identify the care taken to engage the senses. Whether teachers dim lights to set mood, or integrate food to create community, or play music to explore culture, each time we tap into the senses, we create the opportunity for deeper engagement. The way to our students' emotions is through their senses. I have no doubt that Disney's success in creating memories and engaging visitors is due in large part to their focus on purposefully designing experiences that engage the whole guest. In a single attraction, all of a guest's senses are invited to participate in the experience. How often is this true of a daily lesson? How actively do we plan and prepare to interact with students through their 5 senses? How does my classroom engage students' 5 senses? What mood or tone would I like to set, and what sensory experiences can help me do that? What opportunities does my subject/topic offer for sensory extension or engagement? What resources can I connect to and bring into my classroom that will create a sensory experience? How can I use color, light, image, video, and written language to reinforce meaning? How can I use smell to reinforce meaning or to set mood? How can I use volume, music, spoken language, sound effects, and silence to reinforce meaning? How can I use texture, movement, air flow, temperature, weight, and shape to reinforce meaning? How can I use food and its various flavors, cultural connections, and emotional connections to reinforce meaning or to build community? In what ways are the experiences I create having a negative sensory response with individual students? I suspect that adding this to our approach to lesson design would yield greater engagement, bring more joy to the classroom, and increase the chances that our students will remember the work we did together.